Material: AISS-304 Grade Stainless Steel. - Good quality of finished product. - Gives double production than traditional system. - Less fuel consumption than traditional system. Snack Food Fryer is used for Making Fried Potato Chips, Finger Chips, Banana Chips, etc. These are avilabe in diiferent capacities ranging from 6litres to 50 litres and in Single Baskets, or Double Basketts Types. Applications: All kinds of fruits,vegetables,dried fruits,etc are fried in this fryer. acuum FryerVacuum Fryers are the deep frying Systems. It contains a lock chamber at the exit of vacuum tube that resist the air to enter into vacuum zone. 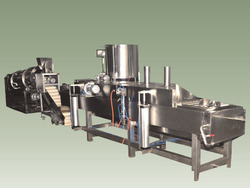 We are engaged in offering wide range of Snack Food Fryer for Food Industry. Our offered product is manufactured under the guidance of professionals with the help of modern technology. Batch Fryer Rectangular, Capacity: 100 Ltr.